Depart City Centre for the fishing village of Howth in North Dublin, we take the coastal route past Clontarf, where King Brian Boru of Ireland defeated the Viking Invasion back in 1014. Continuing up to the summit of Howth Hill, spectacular views of Dublin Bay can be seen on a clear day. Travelling north around the coast, we come to the town of Portmarnock and then to the seaside village of Malahide. 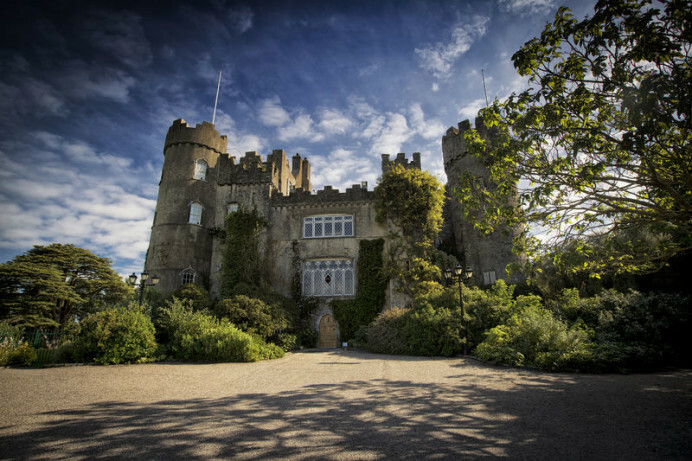 There will be time to explore Malahide Castle and its grounds. Malahide Castle was home to the Talbot family until 1975 for 800 years. The castle is 12 miles north of Dublin City and houses the Talbot family portraits and also exhibits from the National Gallery of Ireland. Originally built as a fortress, additions to the building have been made over the year, so it now has a classical fairy tale appearance. The castle stands on 250 acres of parks and woodland. The history of the castle and the Talbots is fascinating – the family were always supporters of King James II, in 1690, 14 members of the family breakfasted together in the Great Hall, and went to fight in the Battle of the Boyne, none of them were ever to return to the castle as they were all killed by nightfall. We will take a guided tour of the castle to see the living quarters and bedrooms where the Talbot’s lived and entertained. A craft shop and coffee shop are built into the old servants quarters in the ground floor and basement. There will be also time to walk around the grounds of the Castle and you may even seen the resident Castle Ghost – called Puck !! We will return to Dublin via the direct route down the Malahide Road to Fairview and on into the City Centre.